Everything you need to know about the eucalyptus tree, from identification tips to typical characteristics; how to spot disease and the best way to maintain a eucalyptus tree. The highly aromatic and fast growing eucalyptus tree is native to Australia and only around 12 of its numerous species grow in Europe’s warmer regions. Also known as the gum tree due to the red coloured resin that oozes from the bark, the eucalyptus tree will vary quite substantially in appearance, from a short bushy shrub through to a tall evergreen tree up to around 30 metres in height. Eucalyptus is part of the very large Myrtaceae otherwise known as ‘myrtle’ of which the bay rum tree, guava, clove and allspice also belong. Only the hardiest variations of the species do well in Britain due to its preference for a warmer climate. The cider gum tree (Eucalyptus gunnii) is found in abundance on the Essex coast, and the Tasmanian blue gum (Eucalyptus globulus) is in prevalent in Cornwall and Ireland. Appearance Eucalyptus trees are evergreen and usually fast growing and will either take on the format of a large shrub or a tree. Some have attractive looking bark that flakes into cream, grey and green patches. Most have aromatic foliage with small yellow, red or white flowers that grow in clusters. Leaves New leaves on younger trees don’t have stalks and are round and blue in colour. Adult leaves are blue-green in colour. They are long and slender and protrude downwards on single stalks. It is from the adult leaves that eucalyptus oil comes from: crush them and you’ll experience that unmistakable aroma. Flowers The flower buds take on a cone shape and grow in sets of three on short stalks. Each bud sports a round cap on its top which is known as the ‘calyptus’. This goes on to drop off to reveal a fluffy, sunburst style flower stamen that is a big draw for bees. Fruit Each flower has a woody, hard pod inside it which releases seeds on opening. Eucalyptus trees prove a big attraction for pollinating insects like bees. Due to their high levels of essential oils, the leaves do not hold the same attraction for animals as they find them hard to digest. Of course the exception to the rule in Australia is the koala bear. Eucalyptus was traditionally used for spiritual cleansing and the oil of the leaves is still widely put to good use for medicinal purposes. 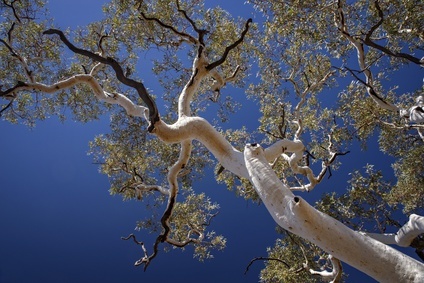 The name eucalyptus comes from the Greek eucalyptos which means ‘well-covered’. This refers to the gum nut covering found over the tree’s budding flowers. The koala bear of Australia lives solely on eucalyptus leaves and myth dictates that it gives the animal a high. However in reality, because digesting the leaves takes a great deal of energy and the leaves don’t really deliver much in the way of nutrition, it results in the koala needing a good 22 hours of sleep a day, which would account for its ‘laid back’ lifestyle. Eucalyptus oil is a well-known remedy for coughs, colds and sinus problems, often used in steam inhalers. It also offers effective relief from infections and fevers and will heal wounds. Eucalyptus oil is widely used as a natural antiseptic and an arthritis remedy and works exceptionally well as a sticky stuff remover. People suffering from depleted energy will also find eucalyptus oil works well to revive their vivacity. 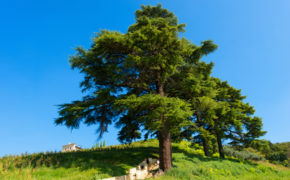 The wood of the tree nowadays is used as timber and its pulp for paper production. The eucalyptus tree needs very little if any pruning as it naturally forms a strong framework. Some varieties, such as the cider gum tree, benefit from hard pruning to promote large juvenile foliage. 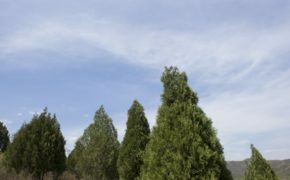 There is a particular process to follow however in order to preserve the good health of the tree, so do seek professional advice from an experienced tree surgeon before you proceed with any pruning. You’ll need to give your eucalyptus tree plenty of water during dry summers, otherwise come the winter the stems are likely to suffer. Also look out for eucalyptus gall wasp. This is a tiny black insect that produces larvae that develops inside raised galls that form on the leaves of the eucalyptus tree during the spring. You’ll see raised swellings on either side of the leaves. These are more prominent in early spring when infestations can sometimes cause heavy leaf fall. Whilst the gall wasp does not affect the health of the tree in the long term, it can reduce the attractiveness of its appearance. If you have a eucalyptus tree on your land that could do with some expert care and attention, why not talk to T.H. Tree Services? As fully qualified and long term experienced tree surgeons, we are able to provide in-depth knowledge and expertise across all aspects of eucalyptus tree care. For a free, no-obligation quotation, give us a call on 01268 642814 or get in touch here. Polite, professional and tidy.The team were punctual, very polite, kept me well informed of what they were doing, anything I asked them wasn’t an inconvenience.Service with a smile and the tidy up job was fantastic too.I would certainly recommend TH Tree services and happily use them again.